Aberdovey Holidays, sea view holiday accommodation where guests return year upon year, passing on their legacy of holiday choice and re-living childhood memories of days gone by…. We have a range of sea view holiday apartments & cottages most directly overlooking the popular sandy beach at Aberdovey on the shores of the Dyfi / Dovey estuary, a haven for sailing and water based activities. Check out our Aberdovey Sea View Apartments or Self Catering Holiday Cottages and Pet Friendly Properties now. All of our properties are inspected and are graded 3 or 4 by Visit Wales. You will find our Holiday Cottages and Sea View Apartments spotlessly clean, with freshly ironed bed linen, heating, electricity and one car parking permit included. Complimentary Wi-Fi too! Aberdovey Cottages, Aberdovey Self Catering Holidays, Aberdovey Sea View Holiday Apartments, Aberdovey Pet Friendly Holiday Accommodation, in a very central location in the pretty Welsh village of Aberdyfi located on the coast of Mid Wales & Southern Snowdonia. There are many natural attractions and some fabulous scenery in the area, especially when travelling by car to the nearby towns of Tywyn Machynlleth and Dolgellau and all within a relaxing 45 minutes drive from Aberdovey. Looking for a holiday in Aberdovey / Aberdyfi you may be considering one of the many options available when it comes to looking for a place to stay from campsites, guest houses, hotels or a B & B (Bed and Breakfast), if so have you considered a holiday let? Why not have all the freedom and privacy you like by choosing from one of our many sea view holiday apartments or cottages. All of our accommodation is either situated virtually on the beach front or within easy walking distance, some of our holiday lets are also pet friendly so no need to leave your dog with friends or at the kennels just bring them along. Its easy to book online or if you prefer just give us a call and we will be happy to help, you can check holiday accommodation availability for all our holidays by date, duration of stay and number of people. 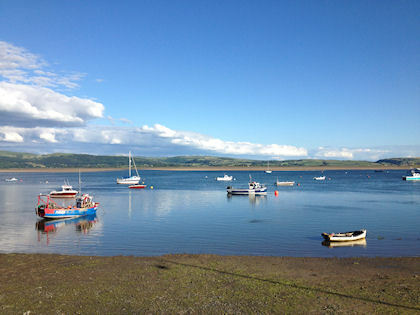 Situated in the southernmost tip of the old county of Meirionnydd on the edge of the Snowdonia national park, nestled on the banks of the Dyfi estuary, Aberdyfi (Aberdovey) is quite simply a gem. Miles of sandy beaches surrounded by rolling lush green hills makes Aberdyfi (Aberdovey) a perfect place for all the family and one of the most beautiful holiday destinations in Wales. A seaside fishing village with a history dating back hundreds of years, Aberdyfi (Aberdovey) offers something for everyone. An artist’s paradise, poet’s inspiration or firing up your childhood imagination, such is the power of this amazing place.